Jennifer Bartlett / Lynda Benglis / Louise Bourgeois / Jonna Rae Brinkman / Louisa Chase / Chryssa / Sue Coe / Leslie Dill / Helen Frankenthaler / Jane Freilicher / Nancy Graves / Harmony Hammond / Margot Humphrey / Anita Jung / Elaine de Kooning / Karen Kunc / Lee Krasner / Lois Lane / Ellen Lanyon / Georgia Marsh / Suzanne McClelland / Phyllis McGibbon / Joan Mitchell / Elizabeth Murray / Judith Murray / Louise Nevelson / Judy Pfaff / Joan Root / Susan Rothenberg / Betye Saar / Niki de St. Phalle / Hollis Sigler / Jaune Quick-to-See Smith / Kiki Smith / Joan Snyder / Pat Steir / May Stevens / Dorothea Tanning / Lenore Thomas / Emmi Whitehorse. As James Yood says in his introduction to Hollis Sigler's The Breast Cancer Journal (Hudson Hills Press, 1999), "Hollis Sigler is not an artist because she has breast cancer; she is an artist with breast cancer." Hollis Sigler was diagnosed with breast cancer in 1985. After an initial course of treatment that appeared to be successful, the cancer reappeared in 1991 and spread to her bones; she decided that she would use her skills as an artist to record her struggles with mortality: her grandmother had died of breast cancer, her mother was diagnosed with breast cancer two years before she was and has since died of the disease, her oncologist told her that she "should not expect to be an old woman." By 1992, the cancer had spread to her bones, and, as she later told The New Art Examiner in 1994, "I really do have to live with this disease, and probably die with this disease. With this in mind I changed my work." 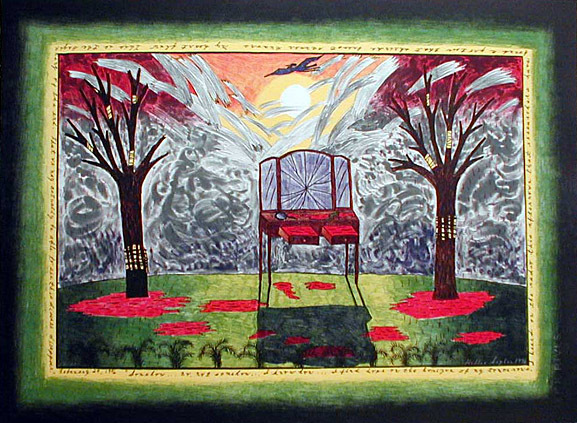 Her first series of paintings and drawings relating to her cancer were shown in galleries beginning in 1992; a large exhibition which received major national coverage and acclaim was mounted in 1993 at the National Museum of Women in the Arts in Washington DC, and works in her series have been shown in many galleries and museums all over the US. Her work is included in the Chicago Art Institute, the Smithsonian, the National Museum of Women in the Arts, and many others. In 2001 she received the College Art Association's Distinguished Artist Award for Lifetime Achievement; she also received the Chicago Caucus for Women Lifetime Achievement Award. She completed over 100 works in her series before succumbing to her breast cancer on March 29, 2001. I find hope on the horizon of my tomorrows. 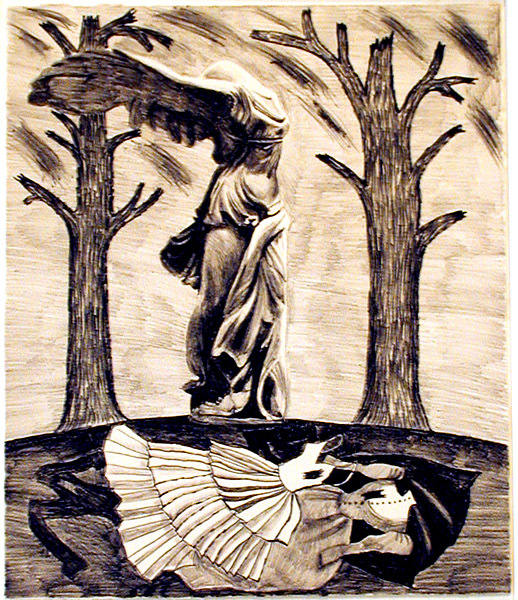 Original color lithograph, 1997. 120 signed impressions plus 20 artists proofs. The text running around the central image says, "February 19, 1996. Somehow . . . no, not somehow . . . I know how I find hope on the horizon of my tomorrow. I heard on the radio this afternoon that researchers have found a protein that shrinks breast cancer tumors. My heart flew. This is the beginning of the end. That we may actually be able to see this disease disappear." Sigler has said that she views her work as "visual poems, and the individual visual metaphors are very important to the pieces. These metaphors, or icons, have become part of a vocabulary that I have used to explore my emotional life on paper. . . . in the Breast Cancer Journal pieces, the vanity showed up again. I have always found it fascinating that we have a piece of furniture called a "vanity," and I have used it frequently as a symbol since 1976. I had always meant vanity, literally: a place where women view their bodies with admiration. Now, the nature of the object "vanity" meant something different. The body was no longer whole. The shattered image of the vanity's mirror reflected woman's pain, her fragmented sense of self. . . . I introduced to the drawings the image of a dead and broken tree. The Lady (a consistent personality in my narratives, but one who is never seen except on rare occasions as a shadow) is trying to repair the tree by reattaching the branches. It is a fruitless gesture on her part, for it will never again be a living tree. The dead tree is the old self, the self before cancer. The lady is struggling with irreversible life changes." In this piece, with its sudden expression of a new hope, the trees are both bandaged, perhaps not dead but only wounded and capable of being healed. Image size: 570x760mm. Price: $3500. We are located at 120 Main Street, Upton MA 01568 in the former Unitarian Church (built 1873). For directions and visiting information, please call. We are, of course, always available over the web and by telephone (see above for contact information). Click the following for links to past shows and artists. For a visual tour of the gallery, please click here. For information about Andy Weiner and Sonja Hansard-Weiner, please click here. For a list of special offers currently available, see Specials.